Without fail, the second Verizon IndyCar Series practice from the streets of St. Petersburg provided excitement on a Friday afternoon in the build up to Sunday’s Firestone Grand Prix of St. Petersburg. Once again there were some dazzling displays of driving (with video streaming courtesy of RaceControl.IndyCar.com) shown from traditional on-track cameras as well as the increasingly important “Visor Cam” being introduced on six different drivers for this race weekend. With lack of grip being a common theme this weekend – and something to get used to for 2018 – there were many drivers overshooting corner entries that had to utilize corner run-off areas and even a couple of veterans that have spun their cars during practice today. In this most recent session, 2016 series champion Simon Pagenaud lost control of his No. 22 Team Penske Menard’s entry in the high-speed turn 3 at St. Petersburg, while rookie Juncos Racing driver Rene Binder preceded him with an identical spin earlier in the session at the same place. Additionally, Rahal Letterman Lanigan Racing driver Takuma Sato was seen overshooting his braking point during the session and had to use a run-off road to turn around. Making some gains in this session were Andretti Autosport. In previous years, the Andretti Autosport outfit had been hampered by the street course circuits such as St. Petersburg, Long Beach, Detroit and Toronto, suffering from poor handling characteristics on the bumpy temporary circuits. 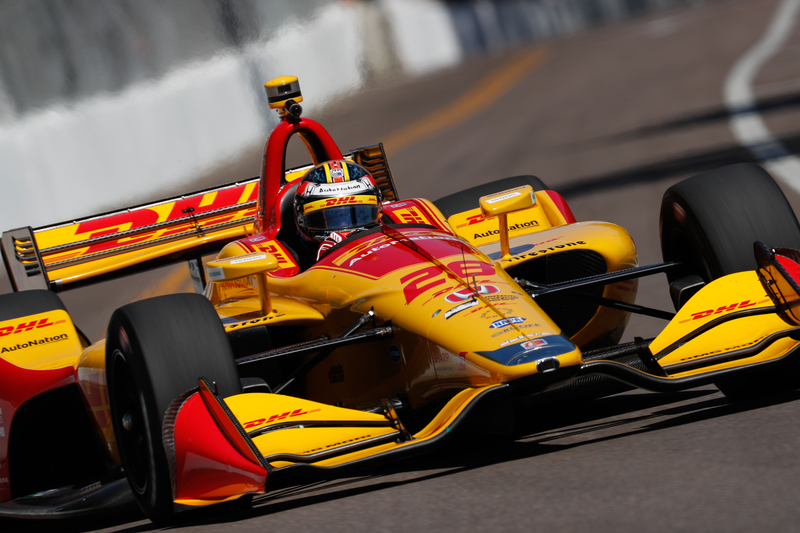 They seemed to have cured those defects just a bit early on this race weekend with Ryan Hunter-Reay leading the way in second practice driving his No. 28 DHL Honda. He was joined by teammate Alexander Rossi in the top-10 with the NAPA Auto Parts No. 27 machine coming in 6th, and the No. 98 of Marco Andretti was in the top-10 until the final moments of practice bumped him to 11th. Most of the fastest times in this afternoon practice session were set with teams testing the waters on alternate Firestone Red tires as the second practice of the day served for a great qualifying simulation ahead of Saturday afternoon’s qualification session. Recovering from a poor start to the day early on was Schmidt Peterson Motorsport’s James Hinchcliffe, who punched his No. 5 ARROW Electronics Honda all the way up to P2 in session two – a good sign for the Canadian still trying to acquaint himself with new lead engineer Leena Gade. Rounding out the top five were Team Penske’s Will Power (3rd) and Josef Newgarden (5th), as well as Chip Ganassi Racing’s Scott Dixon in 4th. Rookie Schmidt Peterson Motorsports driver Robert Wickens continued his nice run in the morning session by slotting in 7th during second practice, and A.J. Foyt Racing’s Matheus Leist was the second-fastest rookie in 12th place out of the 24 cars to take a lap. The day will end with Pirelli World Championship practice before things fire up again tomorrow for multiple Mazda Road to Indy feeder series races, a Verizon IndyCar Series practice and then IndyCar Series qualifying taking place later in the day Saturday. On Saturday, IndyCar teams will take to the track at 11:10 a.m. Eastern for a 45-minute practice session and then qualifications for the Firestone Grand Prix of St. Petersburg will begin at 2:20 p.m. Eastern. All sessions can be seen by visiting RaceControl.IndyCar.com where you can catch streaming video, commentary from the Advance Auto Parts INDYCAR Radio Network, as well as timing and scoring. Stay tuned to Open-Wheels.com and the Open-Wheels social network for session updates throughout the week. Images courtesy of Joe Skibinski of INDYCAR Media.